2019 – (closed the 25th December and the 1st January). 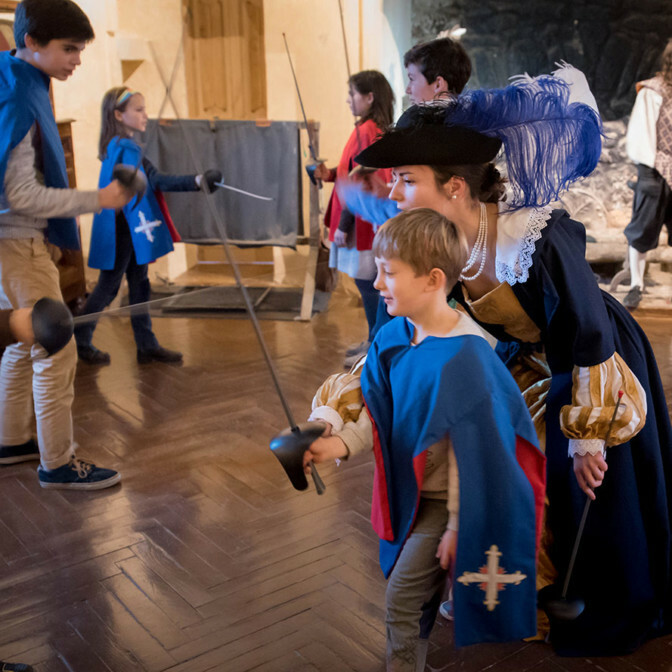 During this festive period, we are proposing activities for the whole family to share in the chateau with falconry and musketeer workshops (see below) and in the tea room in front of a hot stove. For the workshops parents are welcome to join in the fun with their children if the sessions are not full. Our workshops are very interactive! Father Christmas will give us the pleasure of his company during the holiday period. 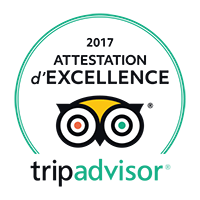 Finally, for the chilliest amongst us, the chateau is well heated and the exterior (facade and gardens) is well lit for everyone to discover at nightfall the particular atmosphere that is Milandes. No extra charge for the activites. If your children would like to have a go at fencing, then share a lesson with Lord de Caumont-La Force! 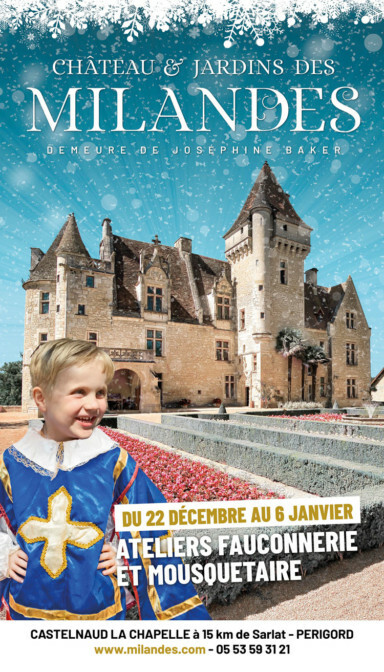 The 23rd December and the 26th to the 31s December 2018; from the 2nd to the 4th January 2019 at 3 p.m. and 5 p.m.
Children will be welcomed by the son of Lord de Caumont who is looking for aspiring musketeers to present to the king. They will wear the celebrated costume of the musketeers and discover the art of fencing in total safety. Attacks, parries, dodging: the workshop lasts 30 minutes and takes place in the ‘Aula’ of the castle, the Lord’s living quarters. At the end of the workshop, the children can show their parents the art of combat that they have learnt. There is no supplement for the animations. Places limited to 12 children. 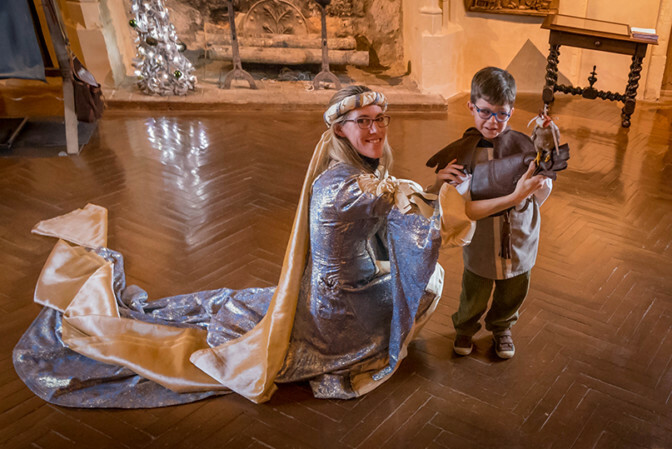 Come and play in the chateau as a princess or a falconer! Discover the world of birds of prey - with costumes and handling of falconry accessories. Surprises await you. For this workshop the children are invited to dress up either as a princess or a falconer to assist the falconer in his work: a playful interlude during which you can learn the art of falconry. 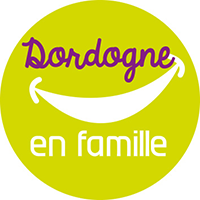 The whole family is invited to participate, within the limit of the number of places available: max. 15 children per workshop. Workshop at 2 p.m. (added due to high demand) and at 4 p. m. from the 26th to the 31st December 2018; and from the 2nd to the 4th January 2019. Reservations for the workshops are strongly recommended at 0033 (0)5 53 59 31 21 or on the Facebook or Instagram pages “Chateaudesmilandes”. Parents can visit the castle while their child participates in one of the activities.